Taking a DNA test : The big adventure! Publié le 14 novembre 2016 CatégoriesRecent NewsÉtiquettes123 an d me, ADN, adn testing, ancestry dna, DNA, family tree dna, genea, test adnLaisser un commentaire sur Taking a DNA test : The big adventure! Yes, it’s a commercial company so yes, its main purpose is to gain benefits from its sales. Yes, there’s handling of biological material so it’s totally normal to ask questions and claim answers about how your personal data and biological material is going to be handle, the safety procedure and what’s there to do about it, but still.this is a way to have informations on your biological history. It took a long time thinking about it, I guess maybe this is linked to ideas we may have, but I told myself « Hey! You only live once! Why don’t you try it? » so I went for it and the least I can say is that I was quite surprised by the results! Now, how did it all happened? I first ordered a Family Tracer kit , this doesn’t trace biological ancestors on, say, a vertical line but analyze your common genomes with people up to five generations both male and female on an horizontal line. also for the sending back where if sent from Europe, sending as a parcel is highly recommanded! The results came in my mailbox pretty handily but the big question was how to interpret them ? This can be a bit puzzling when you don’t have a so-called hard sciences background. However, I could make out the results and consult the database to connect with biological cousins which was great to do! I then ordered a MtDNA test which would give me informations on my maternal line , MtDNA my mother’s mother’s mother’s mother female ancestors and hundreds, if not thousands of before them. The ritual was exactly the same as with the first order, only the analysis, only the results, would be different. When they arrived, I had the surprise to discover that my MtDNA haplogroup was J ! J,is a group that came to Europe via the middle east and developed in western europe over the time 20.000 years ago. Not the first group, it’s not ultra rare either. With maternal lines in England ,that was surprising to learn about mediterranean roots, even if we all come from Africa at some point, but very interesting too. If that anglo-saxon bit was of course known until the point of not having documented sources at some point, I didn »t know I had a small percentage of presence of the group in Turkey. I also have access to a migration map which shows the direction taken by the group which was interesting to see and the level of presence of each group on each continent. Now, what I really liked but for mylevel of knowledge found a bit puzzling was the possibility to check which chromosoms you share with who. Knowing that I share a segment of A to B chromosom with say, John Smith is a quite interesting but mysterious information at the time and I’m longin to discover more about that as my DNA knowledge broadens. I have also the possibilty to join projects who gathers FamilyTreeDNA members around an haplogroup, a theme, a surname, a region. I find those exchanges really interesting especially when you are looking for common branches and this brings me to what I love best is finding new « cousins » ! 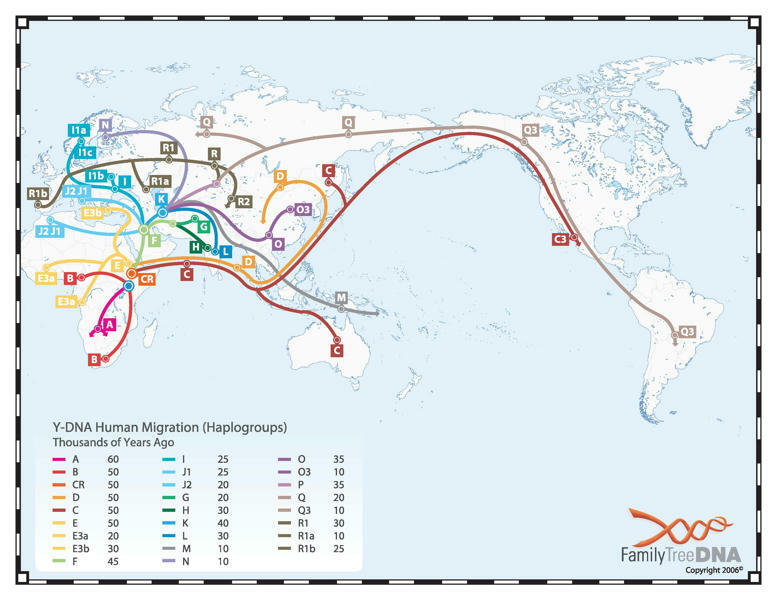 Yes, it’s a bit puzzling at first, we know we are biologically related at some point, and the range goes from 3 generations (where you can still identify in sources even roughly sometimes where people came from to « distant relative » . I have found « cousins »in the US and they too don’t know where we are related which adds to « family » mysteries but is great great fun! The degree of connection is also shown in the database which enables you to focus on certain surnames, period, centuries and try to narrow the link as much as possible. I wish I could do it for my paternal line as well but since my dear father passed away years ago I have to convince an uncle or wait for my son to be older to proceed if he wants to! Regularly, I’ve got updates and a message coming into my mailbox telling me about a new match for me! It’s everytime great fun to discover who that person is, to send a little message to say « hi » and exchange families stories. Now, is it worth it ? Yes! Is it great fun ? Yes! Is it interesting ? Yes! but it’s also a totally different thing to what we family historians are used to and yes of course it’s important to keep the privacy/commercial question in mind when proceeding. But it doesn’t mean that you have to give up the idea of doing the tests! Read about it, talk to fellow tested persons, share your thoughts and feelings and then make yourself an idea of what is good for you to do! I’d do DNA tests again if I have the opportunity as I find it a nice way to find more about my past, in a way that is not (or not really) possible on documented-sources evidences.